Much of Lake Mohave, at the southern end of Lake Mead National Recreation Area, is bordered by gently sloping desert plains rather than hilly, rocky terrain, but the land does rise higher to the south, in particular the southwest, where the Newberry Mountains have several peaks over 5,000 feet. 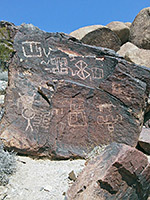 The most prominent summit in the range gives name to Spirit Mountain Wilderness Area, which contains most of Grapevine Canyon, a relatively large drainage that is dry for most of the year and not particularly interesting apart from a short section just outside the wilderness area which contains a spring, some shallow granite narrows, and most notably, several hundred panels of petroglyphs, etched into the grey and brown rocks at the mouth of the upper section of the canyon. 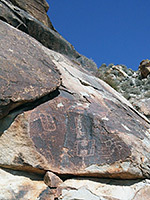 This rock art was created between about 1200 and 1800 AD, and reflects the cultural significance of the surrounding mountains, still considered sacred by several Southwest tribes. 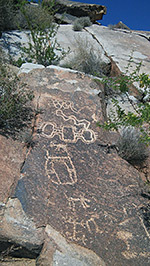 Most visitors to the canyon just walk to the petroglyphs and return, a round trip of not much more than half a mile, but exploring further upstream is also worthwhile, along a moderately overgrown ravine past occasional pools, short enclosed passageways and abundant plant life. 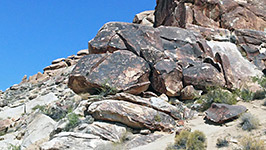 Grapevine Canyon has two main enclosed sections, separated by one mile of flat, open land, across which runs the access route, the unpaved Christmas Tree Pass Road, which begins 2 miles south at an intersection with NV163, the Laughlin Highway. This (signed) junction is 6.2 miles west of the Arizona stateline. The initial section of the side road, and the 900 foot spur to the Grapevine Canyon trailhead, Is fine for all vehicles, though the surface deteriorates somewhat as the road continues north towards the eponymous pass, and later descends to US 95 near Cal-Nev-Ari. 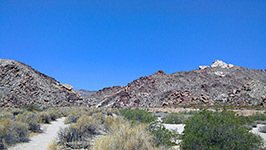 Downstream of the trailhead and the brief open area, Grapevine Canyon becomes increasingly confined by cliffs and steep slopes, and reaches Lake Mohave after 5.5 miles, while upstream, a broad path leads a quarter of a mile along the low, sandy banks lining the south side of the wide streamway to the edge of the hills enclosing the upper few miles of the drainage. 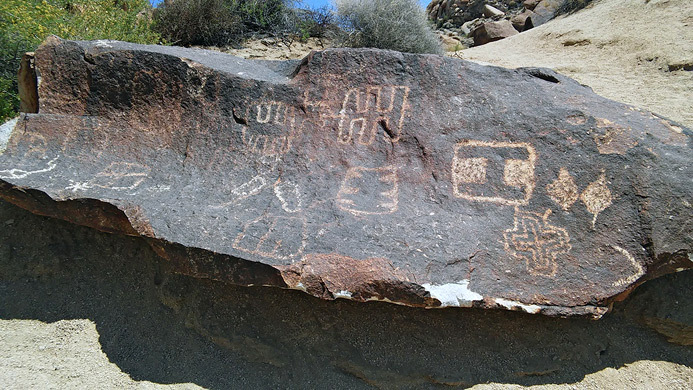 The petroglyphs are found on boulders and rockfaces on the north and south sides of the wash, from close to the stream to about 50 feet up, and the majority are crisp and distinct, and not much affected by modern graffiti. Designs have a wide range of subjects, including geometric shapes, hunting equipment, animals and human figures. 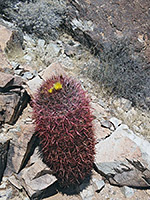 Across the open plains, and the upper canyon walls, vegetation is typical of the Mojave Desert, with such plants as creosote bush, indigo bush and red-spined California barrel cactus, but in and around the streamway further up the canyon are found a wider range of plants, sustained by increased moisture resulting from several springs, the main one (Moss Spring) reached after another half mile of walking, somewhat more strenuous due to boulders, slickrock and undergrowth. Around here are found some of the wild grape vines (vitis arizonica) after which the canyon is named. Further upstream are some more shallow narrow sections, and, in wetter times of year, a few pools and cascades. A fork is reached after 1.4 miles, above which the two streamways are shallower.